I was lucky that I happened to stumble into the opportunity to work for a Unilever company just out of college. I started as a temp employee supporting the medical marketing department at Slim-Fast Foods, and later came to discover my love for CRM (Customer Relationship Marketing). During my time spent at Unilever, Clorox and L’Oreal (Slim-Fast, Burt’s Bees and The Body Shop) I learned a lot about branding, product development and forecasting, and the difference between body butter and hand lotion, among other things. The insights I share with you today all belong to the theme of building authentic connections. Connections with both your consumers and your colleagues. Many brands are faced with attempting to develop loyalty and relationships with consumers at a distance. Because CPG and manufacturers sell their products through retailers, they have very few opportunities to get consumer information or purchase behavior. Having a unique brand voice becomes extremely challenging. This is why Unilever and other top tier branding companies have brand universities and handbooks. I attended Unilever’s Marketing Academy for a week in Tarrytown, NY. There, up and coming marketers learn a consistent method for branding via the Unilever BrandKey, as well as meet and learn from each other. We saw a presentation from the Dove team who originally came up with the Real Beauty concept and learned about how they brought it to life. We worked on case studies together, and even went to a consumer’s home and talked with her in her bathroom and laundry room to learn about how she uses her products and why she chooses them. 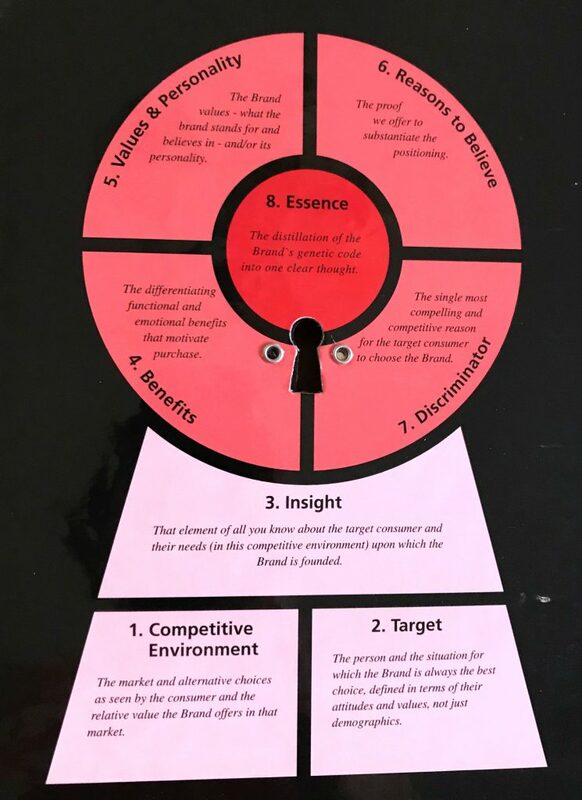 The BrandKey is a distinctive way to visualize the essence of your brand, as you can see below. What great CPG players understand is that there are multiple emotional factors that tie into brand loyalty, not just logical factors. A brand must stand for something, in addition to providing product benefits and value. This is where the art comes in. 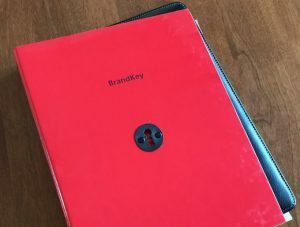 You can distill down your brand into a understandable brand key, but without the knowledge and finesse to communicate it and resonate emotionally, you haven’t build a great brand presence. Thanks to my Dutch counterparts and US colleagues at Unilever, I learned that work and fun should be combined wherever possible. We tasted the best ice creams in the store to help decide on our favorite flavors to send to the flavor house to emulate for a new flavor of Slim-Fast. 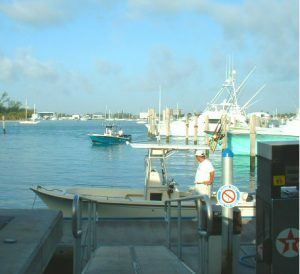 Leaders held off-site meetings at a beautiful marina and a global leadership meeting in South Beach, for which I provided a beachy tropical soundtrack. 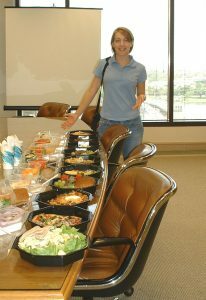 We had a chef prepare some of our healthy recipes for the team to taste and try together. One cultural difference I found very interesting – in the Netherlands when it’s your birthday it’s your responsibility to bring your own birthday cake and share with everyone. I hear that birthdays are very important to the Dutch, and they take pride in remembering everyone’s birthday. We can all learn a little from the concept of taking personal responsibility for creating fun for yourself and others. Much to my later personal enjoyment and potential career pitfall, I took the fun mandate to heart as I proceeded along my career path. Somehow, every excursion, trip or company party I managed to attend or plan ended up revolving around good food, camaraderie and discovery. I’ve been written up in the paper for orchestrating outrageous food competitions, and I’ve known to take a long lunch here or there to attend a new restaurant food tasting for my food blog. Entertaining corporate parties and cultural events can’t replace a good boss, respect from your peers, and satisfying work that you enjoy. But they help build a shared sense of community with your group of work folks and give everyone things to look forward to other than Friday afternoon. 3. Corporate work can reflect your values. My time at Burt’s Bees and The Body Shop showed me that companies can truly focus efforts on sustainability and fair trade sourcing and make a difference to people around the world. At Burt’s Bees, our offices and warehouses and production facilities were zero waste to landfill. We sorted and composted and were held accountable for our waste and energy usage. The entire company went to volunteer to plant community gardens, and maintain gardens with SEEDS in Durham. We conducted clothing drives to donate clothes to migrant farm workers whose arms were burned by pesticides. Our packaging team worked with innovative recycled and compostable materials while our product development team used unique real ingredients in an open lab, made possible because they didn’t use harsh chemicals in their formulas. Glamour visited the lab and got to make their own custom balm. At The Body Shop we took up a different charity cause each month and collaborated with our stores each quarter to help generate money for worthy causes. We fought globally against animal testing. We celebrated uniqueness in our staff and field teams. We learned and trained our teams about the communities and fair trade farms where our ingredients came from. Bringing teams together around a shared value to make an impact, even if in a small area, can energize everyone and unite them for a common goal. By recognizing that we are here to spend our time doing more than simply selling a product and making money, we can tap into more authentic connections with one another and get more enjoyment out of our time working together.